You are currently browsing the category archive for the ‘alternate space’ category. 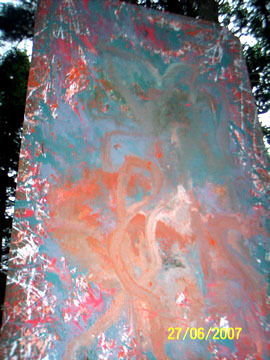 This is a sibling to the other tree monolith, although they were painted about a week apart. They’re both about 8′ by 4′ and this one makes its own unique music against its trees when the wind blows. It was a splatter job, and is even possessing in its folds some chunks of hard, unfluid paint that was unwilling to liquify before being applied. It was through these these chunks that i was able to draw the twisting lines you’ll see, not by touching the paint, but by manipulating the canvas. 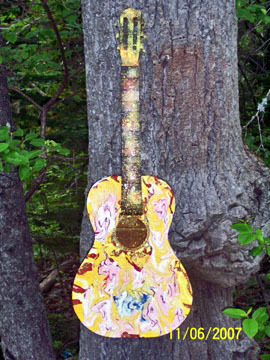 This is a big fun work, drip and splatter painted on thin old ruff plywood. I really felt the ghost of Pollock at my back on this one. I really almost indian-danced around it like it was totem pole. I love this painting. This is the biggest painting i’ve ever done. It’s 15 feet vertical/ 10, horizontal. Right now its hanging more like a flag or a tapestry outside off of my porch balcony and i think it will remain outside, unsold, in my collection so only the sunshine and rain can really own it. It is a piece i’m very proud of. It is unique amongst all my work. 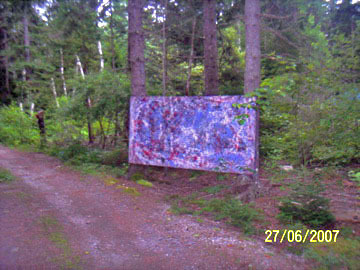 The methods used to paint it are mine to know and yours to wonder.